I am posting this on behalf of Jayne Butler; it is a reflection of the silver surf on the sand here on Weston Super Mare Beach. She will be posting more about it soon! 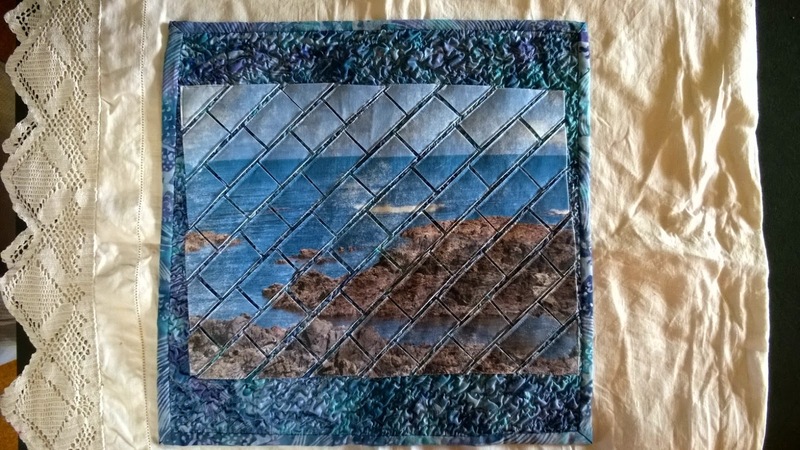 It is early evening on the 31st December 2014 and I have managed to finish my quilt challenge. When I first read the theme of “sea”, my mind went into a spin. Do I do actual sea, look up the dictionary meaning or go with the flow of sea – ocean – beach – surf lifesavers. In November I sat with a cup of coffee and my girlfriends during a quilt retreat, throwing ideas around. 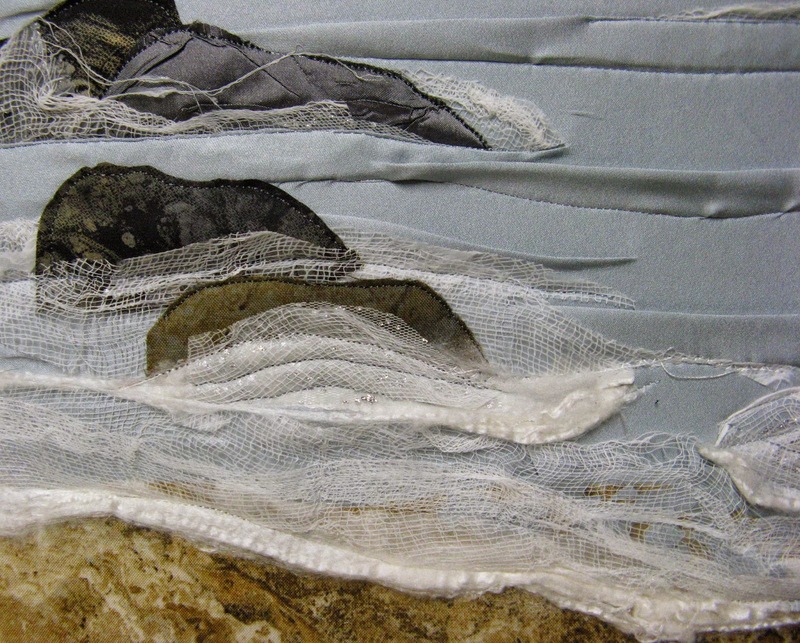 I planned, sketched and worked on making waves from sewing rows of organza and chiffon close to each other. Looked okay but my imagination would not let go of surf lifesavers as when I think ocean/sea/beach that would be the reason I am there. My husband has been a Surf Lifesaver since he was 16, (our whole dating life was spent at surf carnivals or beach patrols) my youngest son followed him into the tribe and just this year my oldest grandson (11 years old)became a nipper (young surf lifesaver) so with that in mind I looked to my stash of fabrics – well a small part of my stash. Next came throwing some threads and “Angelina fibres” onto a background of pale blue muslin. This I hoped would show through layers of chiffon, net & organza as seaweed. Layered over the threads with net and “wash away “ fabric then using variegated thread in the machine and a free motion foot, I stitched wave like lines to hold it all down. Using a waved shape ruler which I had bought many moons ago with great intentions, I cut strips of various fabrics. Plus cut the photos out. This was all done in preparation for my trip to Walpole where we have a lovely holiday cottage. As usual my sewing room is packed up and brought down with me. I hand stitched each wave strip onto the thread covered muslin backing, with a mixture of variegated crochet yarn and shiny machine embroidery thread. Starting at the bottom of the block I layered as I went until a photo was to be included then carried on to the top repeating the process. As I inserted a photo it was hand embroidered and beaded depending on the details I wanted to pick out. Next I tested the words on the design. First neat and orderly then thrown on. I called hubby in for an opinion and thankfully he agreed with me that the thrown on words worked best. Took them off and cut the block to size using the wave ruler. Next the wadding (a little smaller than the top so it didn't pop up in the curves) and backing which was small hessian squares, were added. As the quilt top has lots of movement I didn't want to put traditional binding on so made the backing a quarter of an inch bigger than the top with the idea of it fraying adding to the piece. I then added more lines of hand stitching, machine stitched the piece around the edge as well as around the words to quilt it all together. I really enjoyed playing with the “waves” effect and trying to pick out interesting designs with the beads. It was nice to just loose myself in the process of art rather than worry about if the finished item was meant to be useful. So thank you for inviting me into the group. I have to admit to procrastinating on this piece. Not sure why I was never a do your homework at the last minute kind of person. I think I was just waiting for the right inspiration. I started with some ice dyed fabric I made this summer. Then I decided to do some free motion "lace" for the coral. 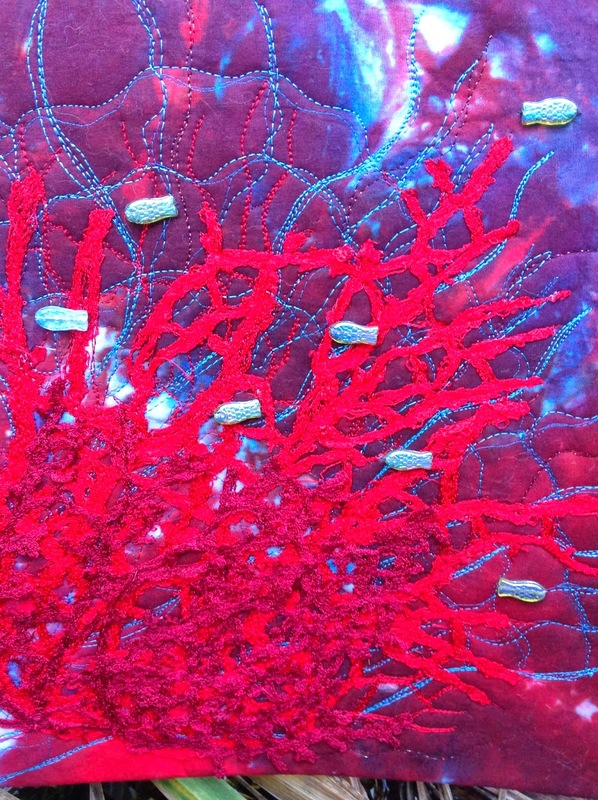 I used Sulky Solvy as my stabilizer and made lots of coral pieces dissolved the solvy away then added the pieces to my lightly quilted piece.It still needed a little something so I added the fish my hand. 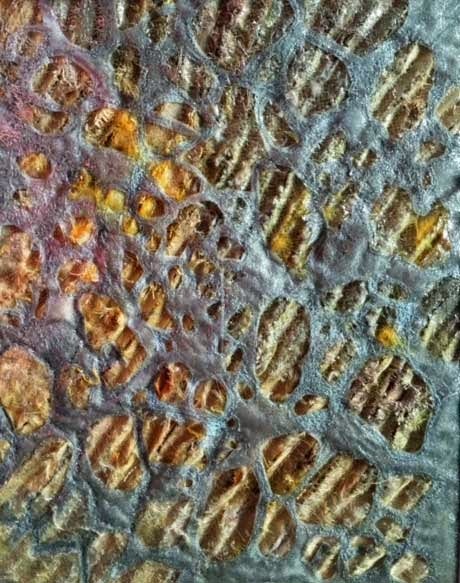 I usually work from my own photographs but in this case I looked at a few photos online of coral then just ran with it just using my imagination. I had a lot of fun and so happy to see so much participation this round. This "Sea" was inspired by my photos from three weeks exploring Newfoundland in August of this year. Lots of ocean vistas, and many days of grey sky, but a wonderful friendly place to get to know. After a fair amount of experimenting on 4x6" pieces, I developed waves that I was happy with. For the base, I used a 12x12" piece of Timtex. Onto it I fused the blue-gray satin, making tucks as i fused to create the wave effect. For the sky I got out y fabric paints and sponged on some darker cloud areas, then covered they sky with fine grey net with a sparkle to it. a line of satin stitch defined the horizon. Rocks in the sea came from my fabric stash, some of them grayed with fabric paint. 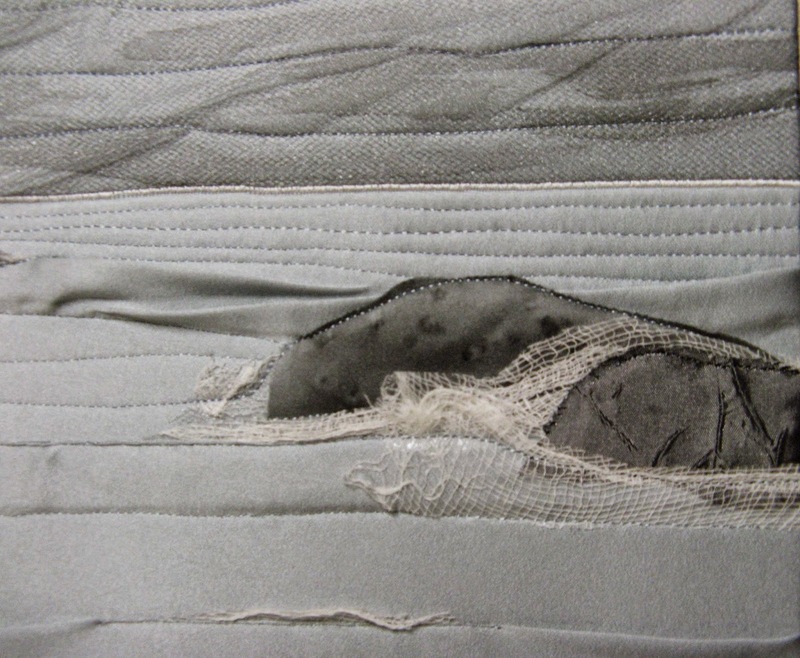 They were slid into the wave-tucks in the satin background. 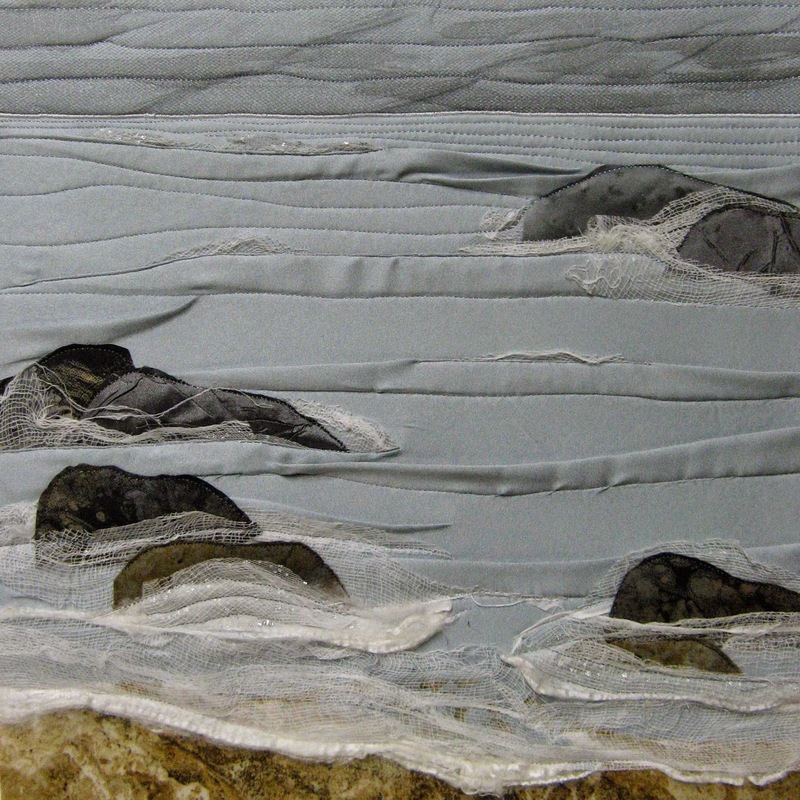 Foam was created with cheesecloth (laid on parchment paper, painted with Modpodge, and then peeled off once dry.) The stiffness made it easier to manipulate and shape. Also part of the foam are some strips of sparkly net and the edges of silk "hankies". These pieces were held in place with strategic bits of Misty Fuse and an occasional dab of Glue-stick so that I could do the rayon top-stitching. This was really a challenge for me -- quite different from my more usual quilting-type projects. Great fun and a great learning experience. I wanted a stormy sea, using some semi-sheer blue rippled metallic/silk fabric, and its unrippled blue, and gold twin. I had visions of crashing waves and craggy rocks, but it just wasn't working because, to me, it looked too contrived. I began this piece by layering some shiny brown poly/organza over batting and cotton and stitched them together with wavy free-motion quilting using decorative threads. I then cut away areas and replaced the cut-outs with the above-mentioned rippled blue and unrippled gold fabrics. I added lots of beads and semi-precious chips, including aquamarines (water joke ...) for the waves and a pewter Christmas ornament and brooch that belonged to my late aunt, who loved her walks along the waterfront on Dallas Road in Victoria, BC, loved birds, and loved my sister and me. Of course, no piece is complete without some glammed and glitzed cinnamon sticks! Here is my Challenge "The Sea"
I took the photo at the beach on Kapiti coast on North Island while visiting my son in Wellington NZ. It turned out a tad wonky so I need to brush up on my placing.... I usually unpick my mistakes but have been to busy and didn't get time to redo it better luck next time hehe!!!! I enjoyed making it and can't wait to see everyone's challenges. Happy stitching!!! 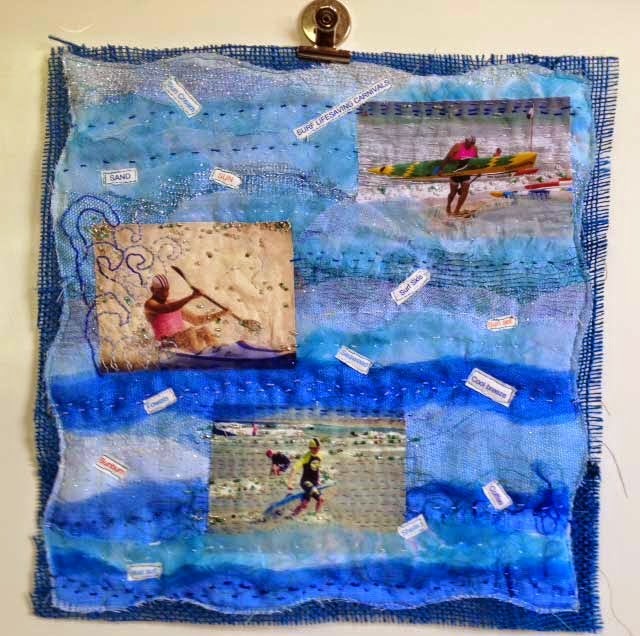 I was pleased with the topic of my first 12 x 12 as I live at Umina Beach, Àustralia and have the most beautiful beach at my door. 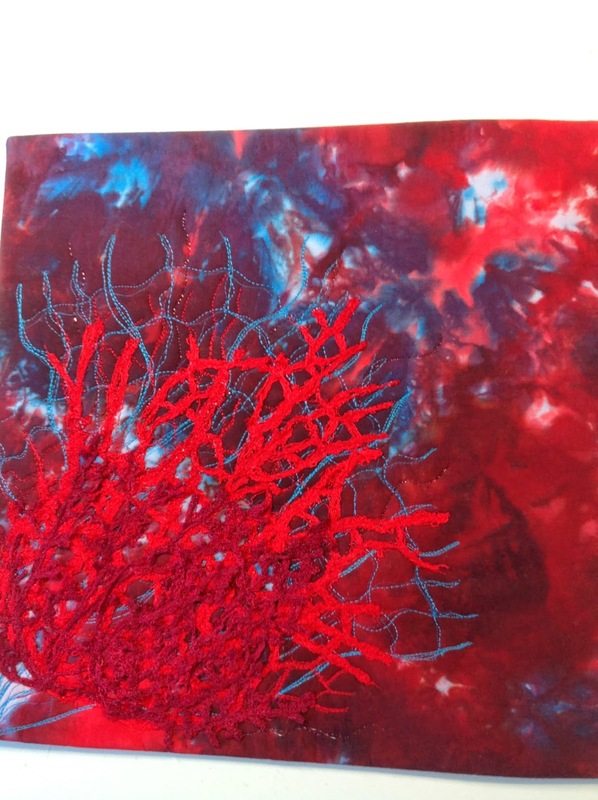 I started the piece with hand dyed silk which I treated with salt to give a bubble effect. 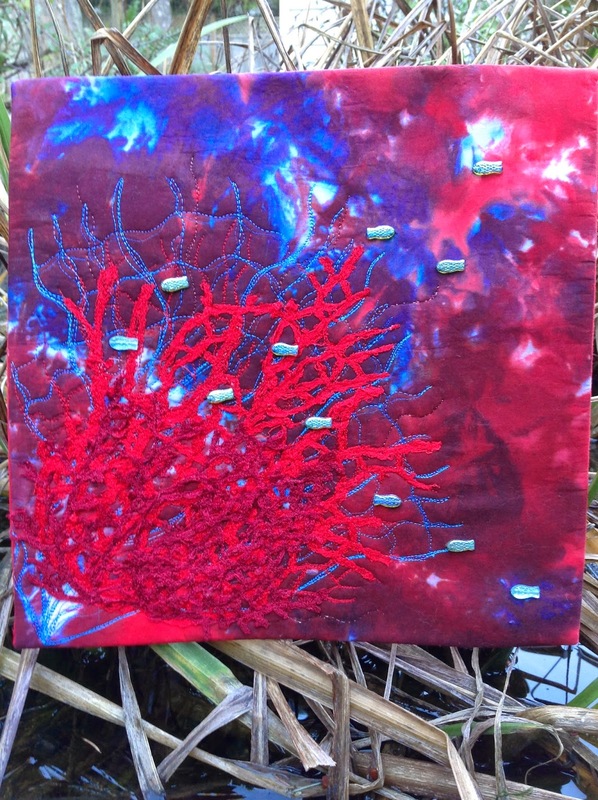 Coral stencilled with luimere paints. I then found a little bag of embellishments that I had purchased in Paducah in 2012 on a whim. The ribbons were couched and then I added beads. A little swipe of moss green sun dyes completed the picture. Overall I am pleased with my first attempt and hope you enjoy it as well. I am almost finished an 18x36" "ocean" piece for another group, so I was pleased the "sea" was selected for our current theme. I chose to represent the earth's wonderful sea water and its movement. In this piece, I tried to invoke the gentle calm swirling the sea does, enveloping bits of bubbly froth and foam. I based SWIRL from a photo my husband took at Friendly Cove on the west coast of Vancouver Island. The background fabric was hand painted with Procion MX dyes after protecting the froth and foam areas with soy wax. 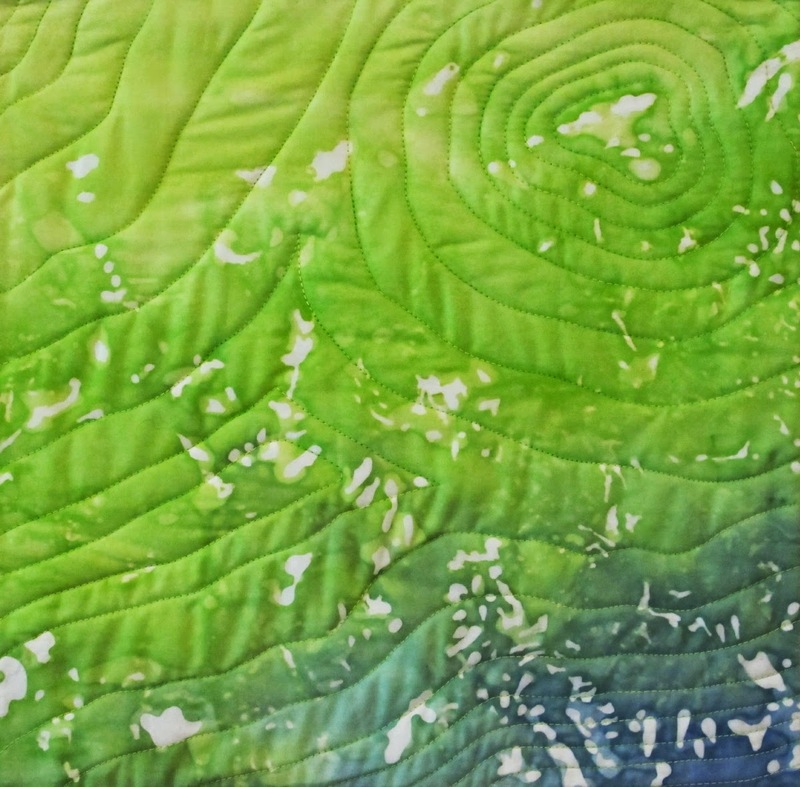 The quilting lines are supposed to mimic the movements of the gentle side of the ocean! I'd like to welcome the new members to this online 12x12 group as well as to returning members. Hopefully 2015 will be positive for all. (I'm away now so posting early.) Oops - I didn't have the cursor in the right place but I'm sure you can figure it out!